When I first saw the above image of this fabulous nursery designed by the incredibly talented duo of Joe Lucas and Parrish Chilcoat of the Los Angeles-base design firm, Lucas Studio and store, Harbinger, my jaw hit the floor. The nursery is part of the Stately Homes by the Sea Showcase from last summer, but I just saw it for the first time yesterday. There are so many amazing details in this lucky baby’s room! 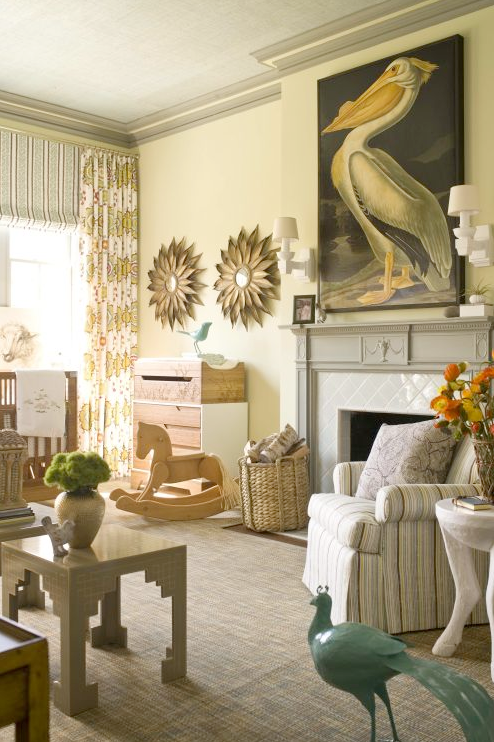 Above, there are sconces by Circa Lighting, starburst mirrors and a statement-making pelican painting from Mecox Gardens and some lovely furniture that would work just as well in an adult space. I would venture to say that what I love most about this nursery is that it isn’t overtly “babyish”. There are beautiful details, like Martyn Lawrence Bullard designed fabrics and Christopher Spitzmiller lamps. There is a seating area that probably doubles into a sleeping space for mom (or judging by the size of the space, for the baby nurse). However, the color palette, framed alphabet above the daybed (available through Harbinger), rocking horse and crib remind us that this space was indeed meant for a baby. The bamboo crib from Kalon Studio features a unique design and Sferra linens, for good measure. I’d like to give a special thank you to Marisa of Style Beat, whose blog post I came across while searching for more information on this beautiful space. She featured a lot of the sources for the nursery as well as other rooms from the show house in her post. Although I like many aspects of this room and I myself am not a fan of "babyish" rooms either, this room is almost rejecting the baby it is intended for. I mean could there be one more Sharp edge in there? I'm sorry to be down on it but it feels like the crib was thrown in as an afterthought. I love the pieces by themselves, love the pelican art work, love the color scheme. But a crib and rockinghorse just don't seem enough to save this room from guest-room-turned-nursery-without-redecorating-3-times. Sorry. Oh, gosh... May 20th already!!! It's flying by! I'm loving this post... with a smile on my face! Now that is a nursery- I think it's absolutely stunning!! pretty much the best nursery, ever! I love this--how could the baby not be a cool baby in this environment? LOVES. Wow- jawdropping. What's so great about this space, is that it can stay this way for many, many years. It won't have to be turned into a "grown up" kid's space. Amazing! I can't believe this is a nursery!!! How stunning and sophisticated. LOVE LOVE LOVE and WANT WANT WANT! Talk about a lucky baby! That has to be the chicest room I've seen in a long time. Nothing like starting that little one on the road to knowing great design, from the get-go :) Love it! This is the most sophisticated and elegant nursery I have ever seen. The color combinations are gorgeous! Have an enjoyable and relaxing weekend! Swoon! What a stunning baby nursery. There was a store nearby me that sold a reproduction of that painting which is an Audubon print that went for a clearance price. I actually love grown up baby rooms and I wish there were more examples of them. I want to be the mommy that nurses in this room. I spent hours in my girls nursery when they were young. How fortunate that they were able to make this so fabulous for all to enjoy! Thanks for sharing! LOVE the art above the fireplace.. Everything in the room flows just right.. I too, love that it's not too babyish... It's gorgeous and not a detail is missed. Wow!